Robert Louis Stevenson wrote his novella The Strange Case of Dr Jekyll and Mr Hyde in 1886 and, in a fit of inspiration, completed the story in only three days. After his wife offered some criticism of the work, Stevenson burnt the manuscript and then rewrote the whole thing from scratch. This time it took him between three and six days. The story begins with a lawyer named Utterson who is enjoying a Sunday morning stroll with his friend Mr. Enfield. While walking through one of Edinburgh’s rougher streets Enfield points out a door to Utterson and then relates a story about an unsavoury character named Hyde who possesses a key to the door. Hyde, it would seem is terrible not only in appearance, but also in nature and Enfield witnessed the man trample over a child in the street. The Lawyer listens to his friends tale with interest. He is well familiar with the name of Hyde because his friend Dr. Henry Jekyll has just changed his will in favour of the man. Utterson is also aware of a fact that Enfield is not: the door in question is a back entrance to Jekyll’s home. As the story continues Utterson sees less and less of Jekyll, who becomes very reclusive and hides himself away from society. Hyde, meanwhile, is wallowing in his own corruption and eventually becomes the most wanted man in Edinburgh when he delivers a violent beating to an elderly gentleman and murders him in the street. It is not until the final chapter of the story that Utterson discovers the shocking truth: Jekyll and Hyde are one and the same. The good doctor had been conducting experiments into the dual nature of humanity—good and evil—and has devised a potion that can seperate the two. 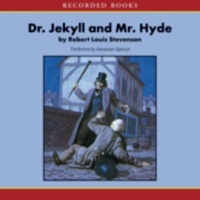 Jekyll tested the potion on himself and once he had released his evil alter-ego he named it Edward Hyde and Hyde is not only of a different nature than his better half, but is also smaller in size, and this is something that is perhaps representative of the fact that Jekyll contains more good than evil while, in a similar manner, Hyde’s ugliness suggests his inner evil. At first Jekyll had total control of the transformation. One potion released Hyde and another potion restored the good that is Jekyll. Eventually though, the power of change was taken out of his hands and one evening he went to bed as Jekyll, but woke up as Hyde. The experiment was out of control and Jekyll found he was losing himself to the monster. Stevenson’s story contains a lot of symbolism that I need not go into here; suffice it to say that the tale can inspire a certain amount of thought from the reader/listener. But it can also be easily enjoyed as nothing more than a horror story, by those who desire only to escape into a story rather than to dissect it. One of the most frightening aspects of this story, as far as I am concerned, is the idea of the loss of self. In a way, when Jekyll is completely taken over by Hyde Jekyll is gone—dead—and few things in life inspire as much fear as the thought of death. The Strange Case of Dr Jekyll and Mr Hyde is one of Stevenson’s most famous stories and countless adaptations have been made of the tale including over one hundred films. The Recorded Books unabridged audiobook version of the story is read by Alexander Spencer and has a runtime of three hours and seven minutes. Spencer takes his time with the story and provides a clear narration that gives a new lease of life to the old story. It is an easy listen and I enjoyed it very much.